This week we have launched a new website feature: “My orders“. This new page allows you to get access to all your current and past orders – with download links for all your orders. Our site has been online for almost 11 years now, and unlike many other sites, we have resisted the temptation to start with “user accounts”. 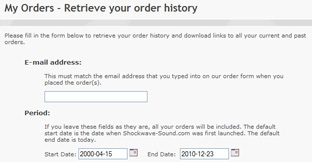 At Shockwave-Sound.com, anybody can come in, place an order, get their product, and be on their way. We do not require people to sign up to a “user account”, with validating your email address, registering all your personal details, coming up with a user name, then forgetting your password between each visit, thus having to use the “forgot your password” process to have the password emailed to you, only to find that the darn email with that password in it doesn’t arrive, so you’re unable to log in and unable to get on with your day. None of this happens at Shockwave-Sound.com, simply because we don’t require people to sign up for an “account” with us before they can place an order. However, there is a flip side to this. Because you haven’t registered a user account, all your past orders aren’t “connected” to each other in the same way that they would have been if they had been attached to your user account. Each order is just a separate entity, without “belonging” to a particular user or identity in a database. And for this reason, there has not been any real way for customers to come back to our site later and get an overview of their past orders, with access to past invoices, license documents and download links. We now feel that we’ve come up with a good solution for this. By going to the “My orders” page, you can input an email address and a date range. When you click “Submit”, our entire order log is searched, and if any orders found to match that email address, an email is automatically sent out to that email address with a full order history, and access to download links. For obvious reasons, the email with download links etc. can only be sent to the actual email address that the order was placed under. So if you placed an order 2 years ago under the email address abc@abc.com, you have to type that exact email address into the form, and the order history is then emailed to that address. If you no longer have access to that email address, and you need to have the order history sent to a different address instead, then you have to ask us to help you with that. We hope, and think, that this feature will be helpful to all of our customers, old and new. Let me also take this opportunity to wish you all a very Merry Christmas and a Happy new Year!